Several retailers have listed the Intel Core i7-8086K as a new CPU for sale beginning on June 8 with shipments expected to arrive to consumers around June 12. 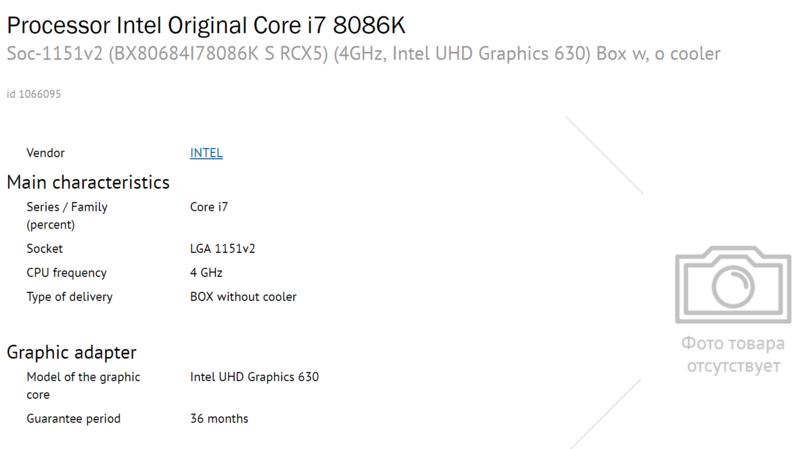 It is believed to be a heavily binned variant of the i7-8700K carrying a little bit of a price premium. All listings of the yet to be announced CPU have the same manufacturer part number (BX80684I78086K). It uses the same LGA1151v2 socket as previous 8th generation Intel CPUs. Pricing is currently sitting at around $480. Intel is using UHD Graphics 630 as the integrated option on the i7-8086K, but realistically anybody interested in it is unlikely to use low-tier graphics options. The main point of contention is what the clock speed is going to be on this anniversary edition CPU. One retailer lists a clock speed of 4GHz while an Italian retailer lists the frequency at 5GHz. A boxed processor sitting at 5GHz could make many enthusiasts overlook the premium pricing applied, but might be a little too optimistic. It is more than likely that this refers only to the boost clock. No matter what the clock speeds end up being, it is assuredly faster than the original 8086's record breaking 5MHz to 10MHz clock speeds achieved on a 3-micrometer architecture. As with all of Intel's other unlocked processors, the i7-8086K does not include a stock cooler. Again, nobody interested in such a part need be concerned by lack of a barely passable cooling solution. After 40 years, Intel has certainly come a long way, but the i7-8086K will not be a perfect CPU. It is still likely to be susceptible to Spectre and Meltdown variants since it will not have a revised architecture. If this anniversary edition is just a highly binned i7-8700K, expect it to run hot as well. This reminds me of my Devil's Canyon 4790K, which is just a binned 4700K with higher clocks and better TIM. It was slightly disappointing for overclocking, since it's factory set clocks were already higher than normal. The highest stable OC for me was 4.6 GHz on all cores. This 8086K looks about the same, but of course at higher clock speeds. Probably OC to 5.2 on all cores, which is pretty awesome. A lot of people bought the Devil's Canyon CPUs, and I'm sure this new top mainstream chip will also be very popular. The $480 price is high for the mainstream platform, and may slow down sales somewhat, being higher than the 8 core 7820X on the X299 HEDT platform. Remember reading about this rumour a few months ago. Intel are savvy at marketing, they can just cherry pick a few good 8700k dies, put a higher boost clock and sell them at a ridiculous premium. Chances are they might overclock only another few hundred MHz over a plain ol average 8700k, but they will be priced far higher. Easy money for them. Considering you can already buy pre-binned 8700k chips for a premium then it's entirely a marketing exercise. They should do a corresponding i5-8088K. Same amount of cores, just half the threads like the original 8088 had a half width data bus. You need one monster of a CPU cooler. Given what I've seem from temps of the 8700K at 5.2 GHz, you are pretty much mandated to have a high-end liquid cooler. 5.2 GHz is really at the ceiling of what these chips can do so even in a best case scenario you are only looking at a 0.2 GHz overclock. So people who got the best 8700Ks are already getting these speeds, especially ones purchased at Silicon Lottery, guaranteed to run 5.2 GHz ($679.99 delidded). This will be the cheaper option, if it really hits 5.2. And I agree, it will need a very good liquid cooling system, probably a custom loop with multiple rads. All this binning, does this mean that the regular 8700Ks still being sold will be all the chips that didn't make the cut, probably hitting a wall at 4.9? Well they have to take the chips from somewhere. The best chips will no longer be 8700Ks, they will be 8086Ks. With all the reviews already showing the 8700K getting 5.0 5.1 GHz, Intel could be sneaky about it and give all those better chips to the new higher binned 8086Ks. The average consumer would likely not notice. This is all an assumption of course but it would be interesting to see 8700K max overclocks a few months after the 8086K releases to see if the average drops. I would like to say it's possible that Intel did the same thing AMD did, keeping the top binned processors for last and then releasing them as threadripper at 4.0 - 4.2 boost but we already know that the whole coffee lake line-up was a rush job, Intel didn't have time to save up top binned processors nor could it withhold it's top performing processors else they loose more marketshare. 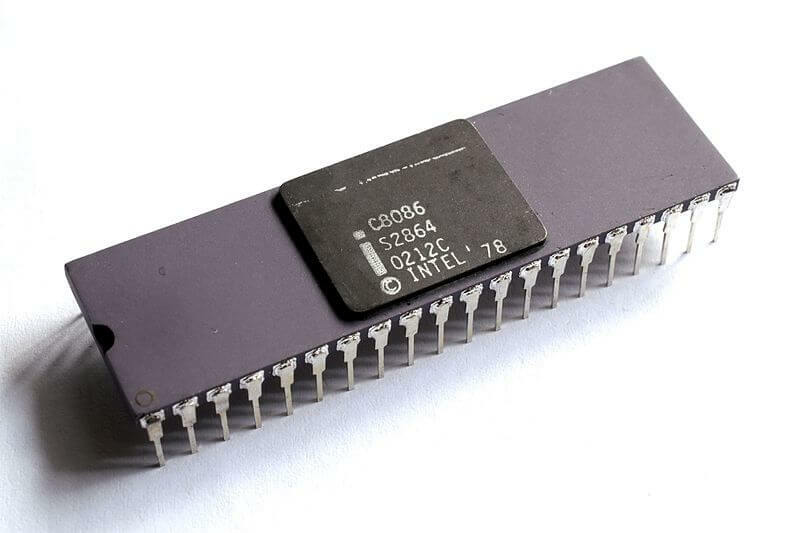 I wonder how many of today's readers know the first photo is of the original 8086 CPU from 40 years ago. Yeah, only 40 pins. Greg: You should've compared architecture, nm to nm: Today's CPUs are @ 14 nm, the 8086 was 3000 nm. Check out this rumor, claims no solder, and that OCUK will offer binned, de-lidded, and naked, plus ones with copper/silver IHS.